We’re almost certain that you’ve been within sniffing distance of non vegan burgers over the last couple of weeks. The Great British Summer is officially underway and everyone is taking advantage of the 7 days of sun with barbeques, beer gardens and ill-advised shirtlessness. This scent of cooked meat can be troublesome for vegans; especially if they are new to the lifestyle. We at Ethical Superstore are well versed in meat alternatives and provide as many tasty options as we can. 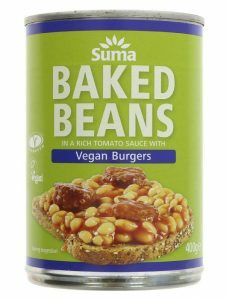 Suma’s latest offering is a delicious, easy-to-make meal that lets you enjoy the taste of burgers and beans completely meat-free! Suma Beans and Vegan Burgers is a quick and simple meal to make. Just heat them up in the microwave or over a hob and enjoy mouth-watering haricot beans swimming among some tasty burger bites in a pool of rich tomato sauce. The burger pieces in this Suma product aren’t made with any meat, or any other types of animal products. Each chunk is actually a small piece of soya protein that has been seasoned well to imitate the taste of beef burger. This meal is not only delicious, but also a great introduction to soya protein as a meat substitute. Once you’ve tried these beans and burgers – and loved them – why not try making some of your own faux meat creations? Beat the meat-eaters at their own game and cook up some mouth-watering meatless meals this Summer!